SELMER – USDA Rural Development State Director Bobby Goode today joined Rep. Marsha Blackburn, Pickwick Electric Cooperative President Karl Dudley and other local leaders to announce funding for jobs in McNairy County. The announcement was made at the McNairy County Industrial Park. Pickwick Electric Cooperative (PEC) has partnered with the Selmer/McNairy County Industrial Development Board (IDB) and USDA Rural Development (RD) to purchase an existing industrial building in Selmer. 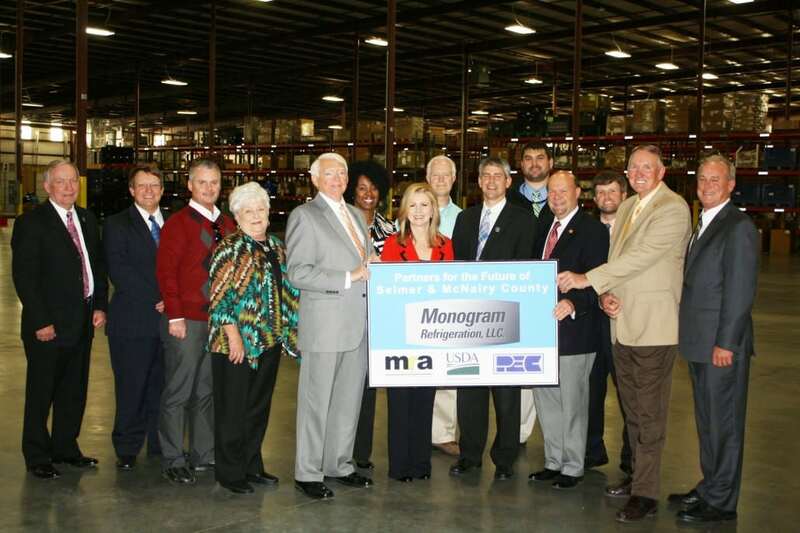 The 125,000 square foot facility will make it possible for Monogram Refrigeration, a subsidiary of General Electric to add a new production line creating up to 40 jobs and keep the company from needing to relocate 160 existing jobs to another location. According to Plant Manager Ray Deming, “Monogram has been manufacturing high quality household refrigeration equipment in McNairy County for almost 30 years.” The company plans to introduce a new line that is expected to go into production in 2015. The industrial building purchase is financed with a $1 million zero-interest loan from USDA to PEC that will be passed-through to the Industrial Board for the purchase of an existing industrial building. Monogram will lease the building from the IDB. The building was formerly home to Midwest Woodworking. Others participating in the event included Sen. Lamar Alexander’s Representative Matt Varino, TN Dept. Of Agriculture Deputy Commissioner Jai Templeton, Selmer Mayor John Smith, McNairy County Mayor Ronnie Brooks, McNairy Regional Alliance Executive Director Ted Moore, Southwest TN Human Resource Agency Exec. Director Mike Smith and RD Area Director Arlisa Armstrong and Specialist Joel Howard. “This kind of public/private partnership is key to USDA’s StrikeForce for Rural Growth and Opportunity initiative to grow rural economies, increase investments and create opportunities in communities that are often held back by high poverty, geography or other barriers,” said Goode. During the last four years USDA Rural Development has assisted more than 1.5 million Tennessee families and businesses in 158 communities, investing more than $3.7 Billion into local economies through affordable loans, loan guarantees and grants for jobs, homes, infrastructure and community development. For more information on the meeting or USDA Rural Development programs available in southwest Tennessee contact the Jackson Area Office at 731-668-2091 x2, or 800-342-3149 x1495. Visit us online at www.rurdev.usda.gov/TN.